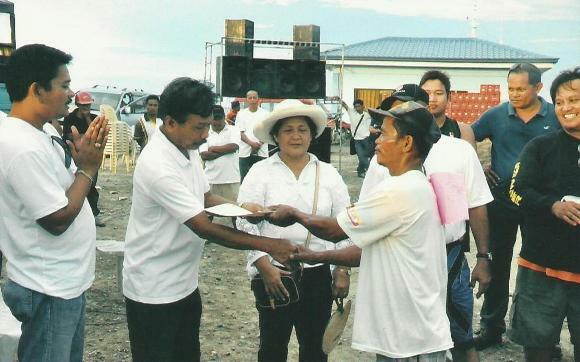 Asenso Sa Baroto Project of Talibon Bohol Philippines was launched on November 4, 2011, one (1) of the LGU programs launched during the 115th Birth Anniversary of the late Pres. 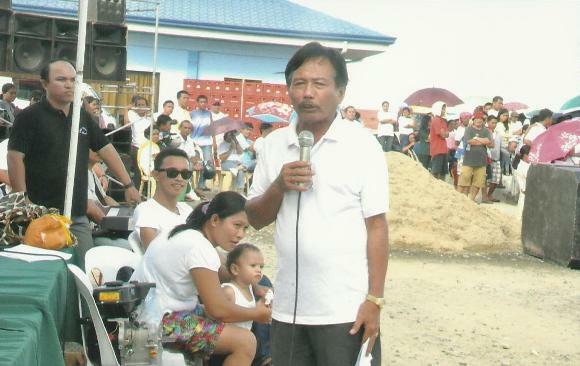 Carlos Polestico Garcia under the command leadership of the Talibon Municipal Mayor, Hon. Restituto B. Auxtero. The affair took place at the Talibon Port Area. 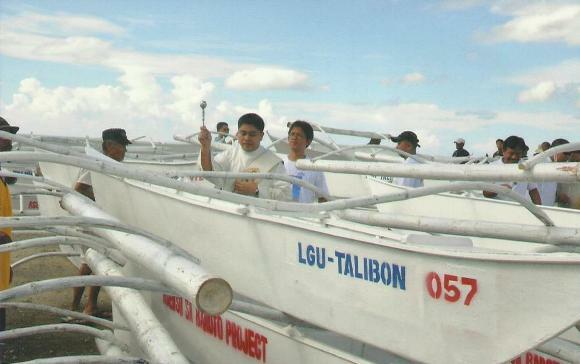 On that fateful day, 82 out of 100 paddle boats were distributed to selected indigent fishermen of the town. Recipient barangays were: Bagacay (3), Balintawak (3), Busalian (3), Calituban (6), Cataban (5), Guindacpan (6), Mahanay (5), Nocnocan (5), Poblacion (5), Sag (5), San Agustin (4), San Francisco (6), San Isidro (8), San Roque (5), Sto. 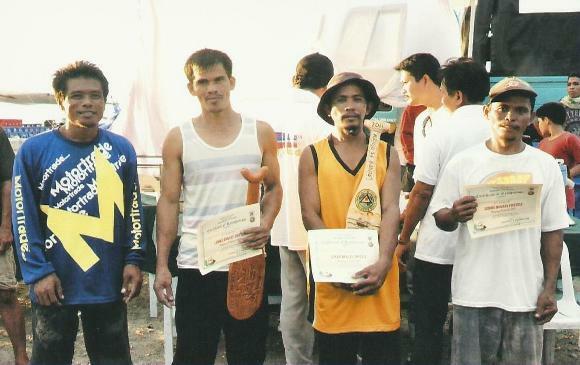 Niño (3), Suba (4), Tanghaligue (5), and San Pedro (1). 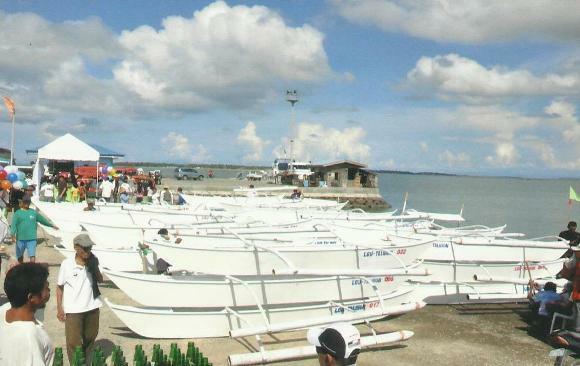 Remaining boats are waiting for cleared applicants under the discretion of the Municipality of Talibon Mayor. 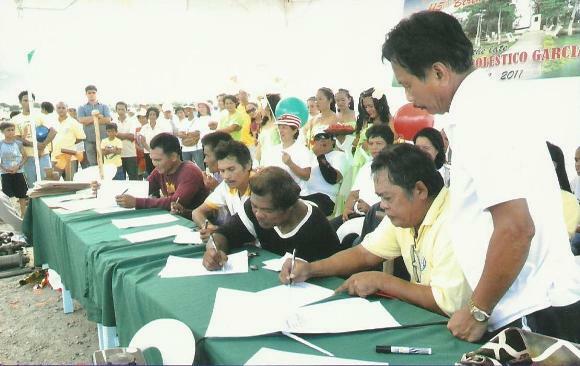 Signings of Memorandum of Agreements between the LGU and the recipients were done; the boats blessed by then Deacon Jerson Justiniane and then distributed to the screened and approved recipients. The affair was attended by young and old alike, all eager to witness the activities lined up for the day. The pier area was full. Everybody braved the hot sun although refreshed at the same time by the cool sea breeze. 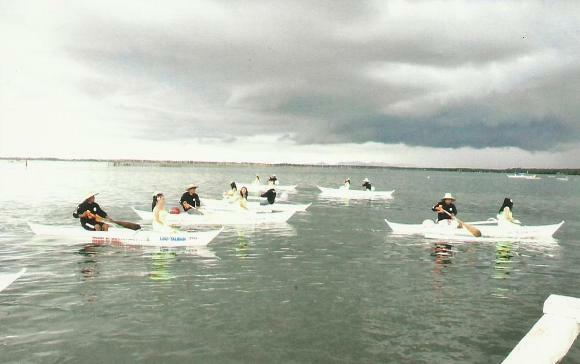 Aside from the blessing of the paddle boats and the signing of the MOA, the 1st Bugsay Festival was enacted first, by the Ritual of Bugsay Festival followed by the Boat Paddling Race. Part of the ritual of the Bugsay Festival was the offering of flowers. 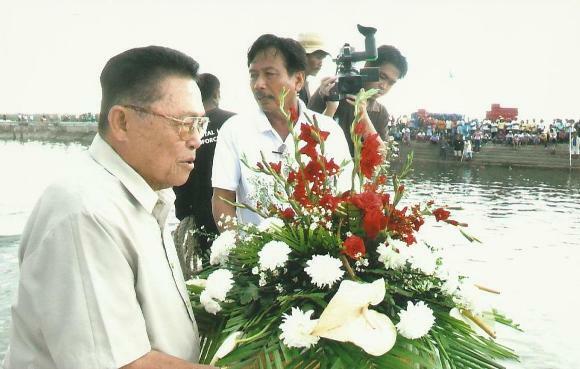 Flowers were left afloat and prayers lifted up to God carried by balloons asking Him to bless the waters of Talibon and render to each fisherman bountiful fish catch always. Then the paddle boat race…..the whole place went up in a roar during the race when everybody cheered for their specific contestants….for father, for brother, or for a lover! For every endeavor is just compensation. The winners of the boat paddling race were given certificates. 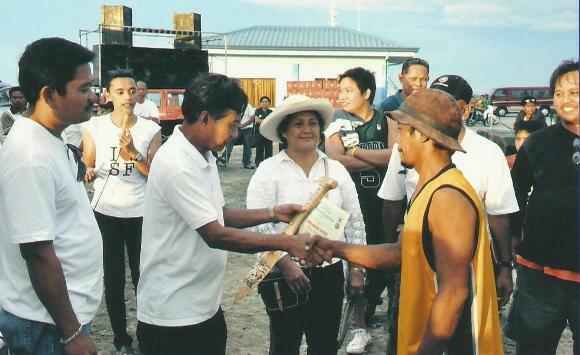 The one who garnered first prize was given a motor and a cash award. How the project came about….. The Municipality of Talibon is located in the northeastern part of the island of Bohol in the Philippines Archipelago. 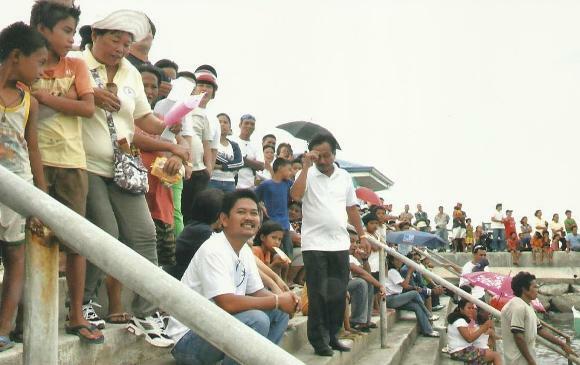 It has 25 barangays consisting of 11 coastal, 6 inland, and 8 island barangays. It also has 37,000 hectares of municipal waters where 70%-80% of its inhabitants rely chiefly on marine resources as their main source of income. It is a hard fact that fishing communities are among the poorest and most marginalized in the Philippines, and Talibon is no exception. It is reported that over 60% of the country’s coastal inhabitants live below the poverty line. Paddleboat (baroto) is necessary fishing paraphernalia for a marginal fisherman. It is primarily used as a means of transporting him to deeper fishing grounds. 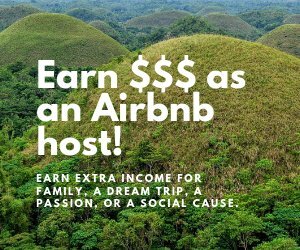 In some instances, it can also be used for eco-tours in the co-management area where tourists could go boat paddling around the 580 hectares of lush mangrove vegetation. In view of this, the Talibon Bohol Municipality Mayor, Hon. Restituto B. Auxtero and other directly involved agencies such as the LGU-Talibon, SB thru Vice Mayor Marcos Q. Aurestila, Barangay LGU (BLGU), the Dept. of Social Welfare and Development, Coastal Resource Management Office, Barangay Fisheries and Aquatic Resource Management Council, met and brainstorm on the best way to reach out and give aid to the indigent fishermen of Talibon. 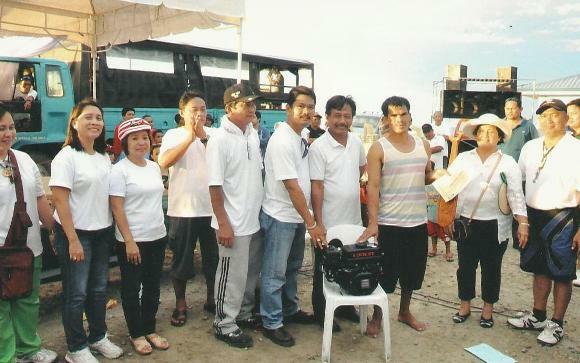 The group came up with the following general objective: To improve the socio-economic condition of the indigent fishermen in coastal and island barangays; which was further broken down to 2 specific objectives: 1) To improve the socio-economic condition of indigent fishermen through increased fish catch; 2) To have their own paddleboats after 18 months. Finally, the group targeted total project cost at P500,000.00 to be sourced out from 20% Development Fund of the Internal Revenue Allotment of the Municipality. The project simply supplies paddleboats to 100 indigent fishermen in 11 coastal and 8 island barangays through installment basis for 18 months. The cost of each paddleboat is Php 4,800.00. 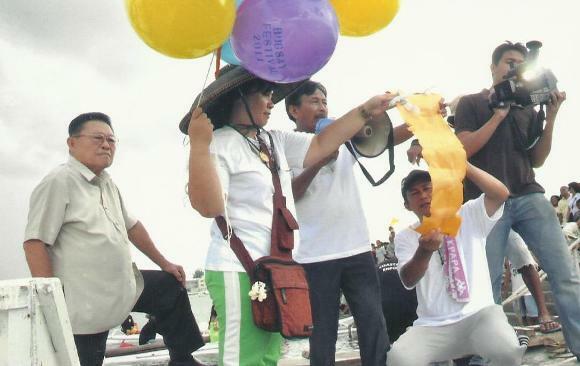 This amount will be repaid by the recipient on installment basis of P10.00/day until such paddleboat is fully paid. November 4, 2011 will come down in history as the “Paddle Boat Day” but this is not the last that you will hear of this project. 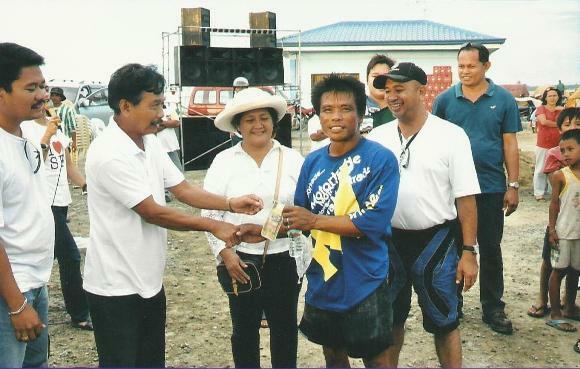 “Paddle Boat” giving is a continuous project of Mayor Restituto B. Auxtero while he is still at the helm of the Municipality of Talibon. 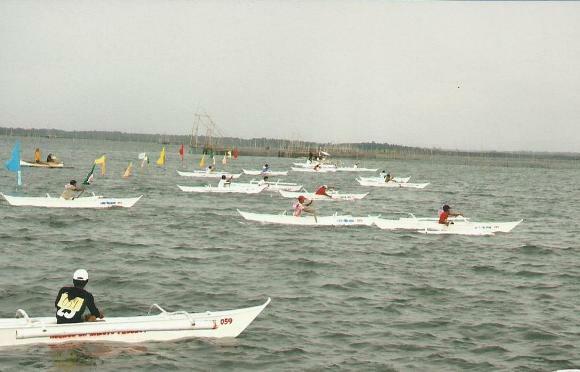 Rigid screening of would-be recipients is still on-going; and for year 2012, it is envisioned that another 100 paddle boats will be distributed. It is firmly believed that with the proper monitoring and evaluation of this project (which is decided to be done monthly by the personnel of the Coastal Resource Management Office, BFARMC Chairman and the Barangay Officials in each Barangay concerned), sustainability of the project will be ensured. The project will surely alleviate the living conditions of the indigent fishermen in 19 coastal and island barangays namely: Suba, Busalian, Nocnocan, Calituban, Guindacpan, Sag, Mahanay, Cataban, Burgos, Bagacay, Sto. Niño, Tanghaligue, San Francisco, Poblacion, San Pedro, San Isidro, Balintawak, San Agustin and San Roque. With paddleboats of their own, they will be able to go fishing into deep seawater resulting to an increase in their fish catch. Tourists can also rent their paddleboats for eco-tours and island hopping, creating an opportunity to earn more.